Well the Henley Royal Regatta is over again for another year but what a year 2010 was!!! 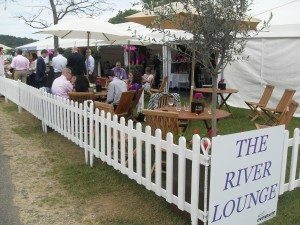 We had super weather every day and our clients were all thrilled with the River Lounge decor and food. I must say that our marquee looked absolutely fabulous this year with white leather seating, Honolulu pink flowers finished with large pink feathers, a Moroccan style chill out lounge, lit LED bar, large flat screen and stunning garden furniture and beautiful furniture inside the building. The food of course did not disappoint and Simon and team had conjured up a feast of delights which were hugely enjoyed by all. We had also extended the marquee to give a larger restaurant and then a smaller marquee attached with private garden area for clients who wished to have an exclusive facility. I have today just received some beautiful flowers from an extremely pleased host whose private group of 30 were thrilled with the day they had which is always music to my ears! We held our first PR day at Henley Regatta this year and that too was a roaring success. We invited key agents, hospitality magazines and top clients to experience the facility because in all honesty, it totally sells itself once people see it for themselves. The feedback was fabulous and at the risk of repeating myself, we truly do have the best position on the river! Just yards from the start line and at the narrowest point of the river, you could almost touch the rowers as they fly past and yes, there were LOTS of lovely muscular men out there to watch!!! We can of course organise transport and overnight accommodation for you and one of my clients did just this with guests arriving on Friday night at the Crowne Plaza Marlow, a coach taking and picking them up from their exclusive River Lounge facility and then dinner and second overnight on the Saturday. I was on hand to check guests in and ensure all was going smoothly and I have had super feedback and some lovely messages from their guests. What can we do for next year? Get all of you who haven’t tried the delights of the River Lounge to come and see for yourself! We can do tables from 2 upwards and the price really is hard to beat for a full hospitality package, all day drinking and in stunning surroundings. Please do take a look at the pictures from this year and I promise you will not be disappointed when you arrive for your day with us in 2011. Thanks as always to Simon, Doug and team, Lana, Tammas and Marc at the Crowne Plaza and of course all the guests who attended. See you next year!